Most of my family is pretty extreme right-wing, conservatives that seem to refuse to open their minds to reality. I’m not someone that is extreme left or right. I feel I’m center-left. I vote for who I think is best for my country, no my party. That being said, I get a few emails, every single day, from a family member illustrating their blind following of the talking heads of the right wing. Sometimes it’s racist, sometimes it’s anti-healthcare, anti-environment, anti-human rights… it’s really upsetting for me. I wonder how someone I love so much can be so against the things I believe in and against me. I want to get married some day, most in my family think I should be able to marry but that gay marriage shouldn’t be legal. The latest email came in today regarding the Cash for Clunkers program. Here’s how it went. Subject: Did anyone do the math? So, the average “Cash for Clunkers” transaction will reduce US gasoline consumption by 320 gallons per year. They’ll probably do a great job with health care though!! I’m sure you’ve already figured out what’s wrong with this email. So, in my response, I decided to calculate in some of these oversights. Howdy! Hope all is well in Kerrville. School and work has me burning the wick from both ends but I think it will be worth it in the end. Remind me again why I chose Physics as an elective?! Probably should have rethought that one haha. Anyways, I thought I’d go ahead and do the math for that email. The original math is flawed, big time. Here’s the real deal. At crude’s highest, June 2008, we were paying $126 per barrel. October 2008, crude was at $68 barrel, after the election it dropped to $49, then into the low $30s before heading back up in the last months towards $72. Over the last 18 months, the average price of crude has been $73.36 barrel. By rounding down 333,333 barrels, and ignoring the oil trends, the email is misleading by $41,000,000. While that might seem like a drop in the bucket of $3,000,000, this price benefit lasts for over one year. Cars from this program don’t stop working after one year. The most popular cars from the Cash for Clunkers program were Toyota and Honda cars. These cars have an expected life expectancy of over 200,000 miles and a cost-of-ownership that sits significantly lower than the most popular cars turned in. Ford trucks, Jeeps and Chevrolet SUVs and Pickups, which have a significantly shorter life expectancy. Using the average distance traveled per year format the email, we can figure how long these cars should be on the road, and thus calculate the long term costs. Using the 18 month average of oil, ignoring inflation, depletion of oil reserves and the lower cost of ownership, here’s how it works out. We have more than doubled our money. 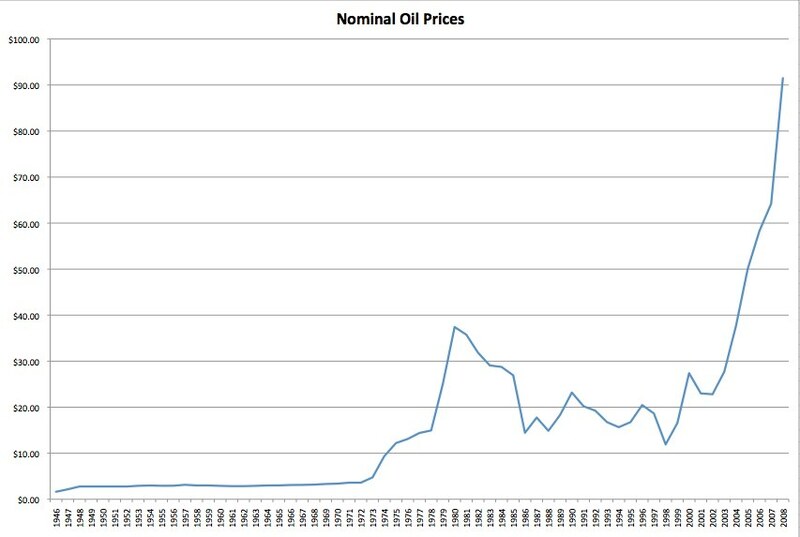 Looking at the attached graph, the idea that crude would stay at its current value is comical. Again, ignoring the fact that oil goes up in price every year, on average, by quite a bit, we still more than double our money back. So yeah, making back the money in one year is ridiculous and I haven’t heard a single person behind the Cash for Clunkers program claim in a single year $3billion would be recouped. But over 16 years, we’ll double it. In just over 7.5 years, if crude oil doesn’t go up in price, contrary to historical data, we would pay off this program, dollar for dollar. And then, there’s the environmental benefits. Not only do these cars use less gas, they put out fewer emissions. The Honda and Toyota cars, which made of the vast majority of Cash for Clunkers cars are Zero or Partial Zero vehicles. The amount of emissions released is substantially lower. I’d have to spend a good bit of time to calculate the total, speculative return on investment for this program. I would have to include a reliable futures for the price of oil, calculate the cost of ownership for the cars new and old and compare the life expectancy of these new cars to the ones they replaced. However, this information would only INCREASE the measured effectiveness of the program. So, yes, someone did do the math and the original math was terribly misleading. If anyone wants to do the stats on this and give me the true numbers of return on investment over 16 years (the life of the car) including cost of ownership and likely oil futures, I’d love to forward it on. It sure felt good to get all that off my chest, though responding to these emails all the time is tiring. Do you find yourself doing the same thing with your family?